The Day I (Almost) Became A Squadron Commander For The Third Time! The Day I (Almost) Missed Going To Iraq. 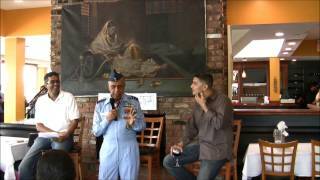 An overview of the flying career of Air Marshal Prithi Singh PVSM AVSM VM Bar ADC, former C-in-C Western Air Command, starting from his Cadet days upto the early onset of the 1970s. Air Marshal S Raghavendran has the unique distinction of commanding the first ever Gnat Squadron. 21 seconds in time can fly fast without anyone noticing it, but as this supersonic jet pilot can testify, it can appear to be a lifetime - and a lot can happen in those short 21 seconds! After the disappointing performance of the missile in the 65 War, No.28 Squadron tested the K-13 missile in live firing exercises. A Canberra flown by Squadron Leader S A Patwardhan was the key in these tests. Wg Cdr N M Dhavle writes about his fighter pilot days flying --- Transports! all in the name of earning his Flying Pay! The HF-24 Flight testing claimed the lives of four test pilots in the years 1970-71. The author revisits these accidents and the events leading upto them. On the upcoming 45th commissioning anniversary of the 94th Pilot's and 32nd Navigator Courses, a brief look at the trials and tribulations undergone by the flight cadets during their training days!. Now Updated with several Photo Albums.